Welcome to the “new” Desperation Morale website! For some, this new site may come as a surprise, while others may have been following news of its slow progress for some months. The bottom line, though, is that the original site was long past obsolete. I can say that I was a very solid web designer in 1995-1996–in fact, some of my websites were written up in magazines. But I never seemed to have the time to keep up with the fast-paced evolutions in web design and, as a result, I got further and further behind the curve. When the original Desperation Morale site debuted in 2002, it was already pretty clunky. Over the next 12 years, the site got bigger and bigger, but the technology and design behind it remained unchanged. Every page was hand-made, using Microsoft FrontPage (long after Microsoft abandoned that software). Every time a new page would added, all the relevant links in all other pages would have to be changed by hand. And the original design of the website reflected that most people would be accessing it via a dial-up modem, not broadband, which extremely few people had at the time. As more and more time passed, the worse the Desperation Morale site looked and the more difficult it became to maintain and update. The content was still incredible, but the container for the content was as fresh and useful as three-month-old raisin bread. Thus in the late winter of 2014, I finally decided to bite the bullet and completely re-design the site. I hired a professional designer and a professional developer to create, implement, and install a new website for me. My goal was not merely to give the site a face-lift, but also to find as many ways as possible to add functionality and usefulness for the end user–you. The cost for this was about $5600, $4,000 of which was actually donated by the amazingly kind and generous ASL community itself. Creating the website, however, was in some respects the easy part. Next I would have to migrate, convert, and in some cases recreate every part of my old website, including the vast World of ASL compendium. Although initially I thought I might be able to hire someone to do much of the grunt work, I soon discovered that there were too many decisions and judgments that had to be made at every turn. There was no other option than doing it the hard way. I’ve spent countless hours during the past couple of months in order to move all the content. Hopefully, none got left behind and there are few to no errors with the content that was moved. 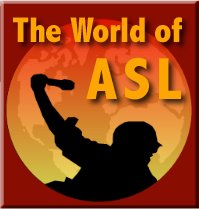 As I moved the World of ASL Compendium, I took the trouble to fix known mistakes and inaccuracies and to go through all the content to find and fix more. I also updated many items, to a greater or lesser degree, and added content to others, to a greater or lesser degree. This includes re-evaluating some products because of the passage of time. For example, when Blood and Jungle and Crucible of Steel came out, I expressed concern in my World of ASL write ups for these two products that not all the scenarios might have been playtested sufficiently (because there were so very many of them). However, I made an effort to see how these products were doing in terms of balance and was pleased to notice that they were not exhibiting signs of the concerns I had expressed. So I updated my write ups to reflect this. One pleasing aspect of the new site is that I am not particularly limited in terms of the size of photographs I can upload. So some of you will notice that many World of ASL products have new, larger images uploaded. More will be added over time. And I am always grateful for high quality photographs of the contents of any ASL product and would credit you with contributing them. So did out your camera and take some pictures. I believe that all the content has been migrated over, except for two out-of-date pages that I knew I would not update and really don’t have a place in the new site. Hopefully, I have missed nothing else. The site is still very much a work in progress, though. In particular, the majority of the INTERNAL links in the World of ASL Compendium (i.e., links from one product to another product) are non-functional. I will be fixing these links and adding additional ones over time, but it will be a slow process. A quick primer is available to explain the many different ways that one can access the data in the World of ASL Compendium. I am sure that many of you will notice errors or issues large and small as you peruse the site. By all means, let me know about them, even though secretly I will resent you for it because subconsciously I really only want warm fuzzies. In any case, I hope you enjoy the new look and new functionality of the site. There are many places to add feedback and comments of your own (another new feature! ), so don’t be shy. Come on in and set a spell. Here it is, as promised ! Thanks Mark. Your Webiste is still the ultimate ASL resource! Oh, and welcome to using WordPress. 🙂 I would suggest that a RSS feed button be incorporated on the blog page, so people can use the feed easily; I was able to point my page at it because I know what the standard location for it is. Great Work Mark. Congratulations you are my hero. Do you have an ASL warehouse, with all the ASL stuff? Impressive collection.